Tired of scrambling around the provincestate collecting paper time sheets at payroll cut-off? Caribou's Logger's E-Time is a web-based electronic time sheet system that integrates directly with your Logger's Edge back office software system. Field workers use a laptop or tablet to enter their time sheets. Supervisors review and approve the time sheets on-line. Upon approval, these time cards are visible and available for correction and processing in Logger's Edge. It's that easy!!!! Bring your business information to a whole new level of efficiency and accountability with Caribou's Logger's E-Time. What makes Logger's E-Time such an obvious next step? Skip the paper, and enter time sheets electronically the day the work is done. Eliminate the costs of wasted gas and time spent collecting time cards from remote workers. Eliminate expensive pre-printed time-sheet books. Eliminate data re-handling and free up office staff to perform more valuable tasks. Managers can report upon time sent by blocktract and by phase as the work is occurring, when they still have time to respond to the information. 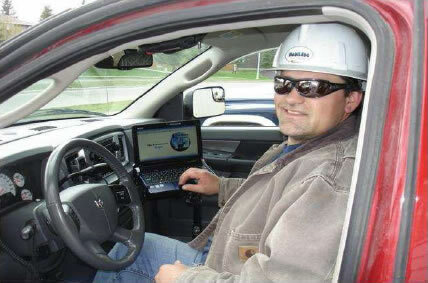 Logger's E-Time is web based, so field workers can use a laptop, iPad, or other tablet to enter their daily time from their crew trucks or from home. They just need an internet connection and login credentials. 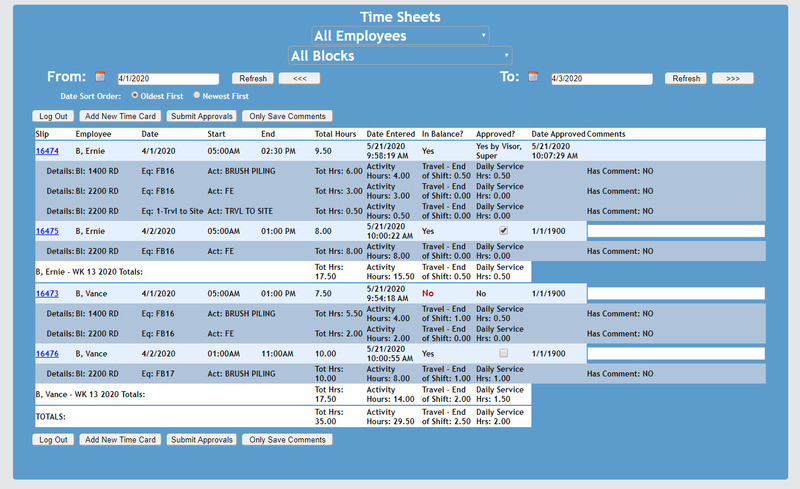 Supervisors can log in and see all time sheets for all employees whom they supervise. They can review/edit and approve the time, or send it back to the employee for correction. Once approved, time sheets are visible in Logger’s Edge (and can still be edited in the office if necessary, even after approval). Daily time sheets have header information that includes the shift start and end time. The software calculates the hours of the shift, and enforces that the hours on the details section of the user’s time sheet add up to the full shift. Not only can you capture different types of hours, you can also capture, things like Kilometers and Living out allowances. ~ Gord Chipman, Alkali Resource Management, Ltd. Isn't it Time to Rethink Your Time Sheet Process? Call us today at 780-833-9870850-532-6206 to schedule a demo or for more information!